Let's start with the buffs! And now for the nerfs! Finally, a few other things. We've been fixing these bugs over the course of Nexus Blitz's time on live. Now seems like a good time to recap! 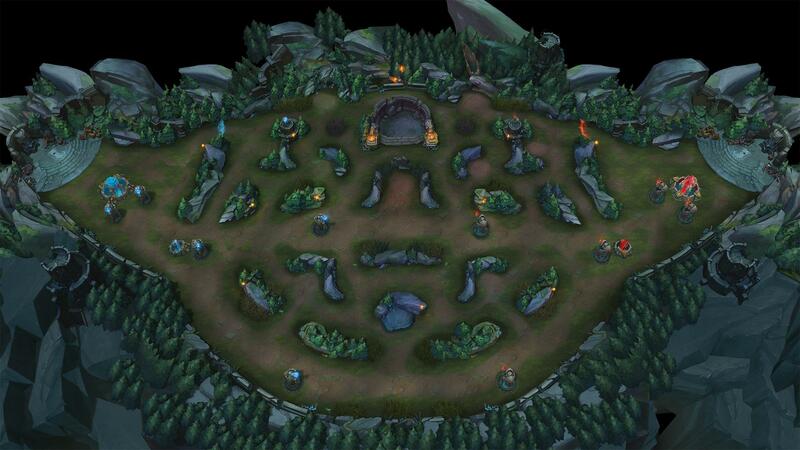 Nexus Blitz is played on a compact map with two lanes and a jungle. Teams are comprised of three laners and two junglers. Monster gold and experience are shared and increased when taken by multiple allies, and buff camps grant their boons to two players rather than one. This spirit of cooperation unlocks jungling for the entire roster as long as they've got a trustworthy partner. Jinx jungle? Try it with Braum! Lanes! With turrets! Bot and top lane converge toward the base and share an inhibitor. Nexus Blitz's claim to fame is its event roulette. Every few minutes, one of several map-wide events kicks off with all ten players participating! You'll get to see the first event in champ select, and once you're in game, there'll be a 30-second warning before each event letting you know what mayhem is about to ensue. Bardle Royale: Both teams battle it out in an ever-shrinking circle of death until only one is left standing. Word of advice: don't recall once the event starts or you'll instantly burn to a crisp. Bardle Royale (Juggernaut): It's Bardle Royale but one member of each team gets increased health and the On-Fire buff! Bardle Royale (Paranoia): It's Bardle Royale but really, really dark. You won’t be able to see either enemies or allies until they’re right next to you! Everyone also gets flat penetration stats to make it the other kind of dark too (murder). URF Deathmatch: Urf the Manatee blesses everyone with insane buffs, including massive cooldown reduction and removed mana and energy costs. Everyone gets three lives. Last team standing wins! Loot Teemo: Chase a giant Teemo around the map and hit him to take his gold! Loot Veigar: A more dangerous Loot Teemo. Dodge the Dark Matter and Event Horizons that Veigar casts around him! Push the Cart: Stand near the cart to push it toward the enemy team's base and blow up the first building it touches. If the event goes too long, the cart gets impatient and decides the next person to touch it wins. Push the Cart (Attack/Defend): A time-capped variant of Push the Cart. Only the attackers can push the cart and their objective is still to shove it into an enemy building. When time runs out, defenders claim the win by shoving all attackers off the cart. Arena: Teams face off in a gauntlet of 1v1s and 2v2s. Strongest vs strongest, down to... less-strongest vs less-strongest. The team that wins the most prize fights takes the event! King of the Hill: Stand on top of the hill until your team claims it. If you push the enemy off, you'll drain their progress before adding your own. Scuttle Racing: An innocent race between two Rift Scuttlers turns nasty as both teams interfere. Use speed boosts and shields on your crab; CC and damage on the other team’s crab. If a crab dies faints, it recovers after a few seconds. Sudden Death (Nexus Blitz): At 18 minutes, the Nexuses get impatient and walk toward the center of the map to fight it out. Win the game by destroying the enemy Nexus, but watch out—someone taught them how to cast abilities. Death timers are reduced during Nexus Blitz! For Nexus Blitz vets, we've done some tuning to make events feel more fair. Most notably, events won't spawn right on top of turrets anymore! We've also made a bunch of UI improvements to better track who's winning on an event-by-event basis. Finally, the Snowball event has been removed, which is a little ironic since it's now Snowdown. Catapult of Champions: Click the giant cannon next to your fountain to launch yourself across the map! Blessing of Blitzcrank: Gives your turrets and cannon minions Blitzcrank’s Rocket Grab. Poro King: The Poro King arrives to aid your team, pushing through top lane! Fluffy helps you siege enemy turrets, breathes fire on baddies, and periodically heals nearby allies. Long live the King! Battle Sled: The whole team can pile into this vehicle, with the first player to click acting as driver. Take a leisurely cruise around the map until you hit something and the sled explodes, damaging and knocking up nearby enemies. Guardian Angel: Your team gets a temporary, one-time Guardian Angel. Statikk Shock: Your team gains Statikk Shiv. Zap! BF Shield: Your team gets big, friendly shields. Mega Cloud Drake: Your team gets mega out-of-combat movement speed. Mega Ocean Drake: Your team gets mega regen. Those of you who played Nexus Blitz the first time around may notice some omissions. Cursed Minions, Blessing of Caitlyn, and Wrath of the Hunter (brush stealth) have been removed. Racking up a killstreak lights you on fire, granting mana and energy regen, tons of damage, and shorter cooldowns, but increasing the damage you take and reducing shields and heals received. Being on fire also puts a sizable bounty on your head which the entire enemy team shares. Nexus Blitz features an armory of items from seasons past. If any of these icons stir up waves of nostalgia within you, hop into queue and relive the olden days. Starting items have been retuned for the mode, including a new Doran's item for enchanter supports (the blue stick). Support items don't upgrade, there's no Spellthief's item, and there's only one jungle item (which upgrades Smite to Chilling Smite when you enchant it). New to our second test, champ select kicks off with a ban phase. Everyone gets one ban and bans champs at the same time! Nexus Blitz features a bunch of mode-specific balance changes for champions and runes to accommodate the faster pace, smaller map, and frequent fighting. We'll have at least one follow-up balance update after the mode goes live.